Have you been eyeing outdoor cooking for a while now? Is the desire for a proper adventure, filled with delicious cuisine too much to bear? Has the appeal of traditional grilling grown stronger, leaving you wanting for more? Preparation of exquisite food is a rewarding, but difficult task. One needs a great deal of effort to ensure ultimate quality—and more importantly, superb taste. If you’re looking to crank your barbecue parties up to eleven, then look no further than this product. What’s the big deal about it, you ask? The Traeger Pro Series 22 Wood Pellet Grill is designed to tackle one of the toughest of culinary arts—grilling. It braves the outdoors like no other, fitted with special equipment—which allows it to accompany you wherever, whenever. The grill comes with a fair share and wide array of features. They range from state-of-the-art, modern technology equipment, to impressive design traits, ensuring that this yard companion delivers. Reinforced with stability via its design, the Traeger Pro Series 22 Wood Pellet Grill offers a sawhorse cart-style exterior. Cold-rolled, powder-coated steel comprises the grill itself, which ensures top-notch durability for your every grilling undertaking. Temperature control provides a great deal of breathing room, even for the most experienced cook. Thus, Traeger sees it fit to serve this grill with its very own, precise temperature control. The Digital Pro controlling device offers insight on the state of the temperature within the grill and presents it on the blue LED display panel. A resistance temperature detector, known as a RTD probe, monitors the internal heat. The RTD probe records 60 readings per minute, which allows it to maintain the select temperature within 15 degrees Fahrenheit. The presence of dual meat probes allows you to monitor the temperature readings of two items, at once—without trouble. If you wish to host a large cooking party, the Traeger Pro Series 22 Wood Pellet Grill is sure to pack a punch. 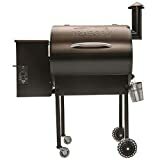 A large bounty of meals swiftly grills on this barbecue’s main grill rack—featuring a spacious 22 x 19 inches of porcelain-coated grilling surface. If this doesn’t sate the hunger of your close ones, then the additional 22 x 7 inch grilling rack might. This adds up to a barbecuing area of 572 square inches, which offers enough space for more than one meal. Versatility presents one of Traeger Pro Series 22 Wood Pellet Grill’s more favorable traits. In one moment, you can set your temperatures at a low of 180 degrees, reached with complete ease. In the very next moment, however, you can turn them up to as high as 450 degrees, without hassle. Convection cooking stands at your fingertips as the natural airflow within the grill allows for delicious baking while you roast. The barbecue ensures that your meat is not underdone—this powerhouse offers 20,000 BTUs worth of cooking power. The Traeger Pro Series 22 Wood Pellet Grill does not shy away from handy knick-knacks, either. A wide assortment of accessories, from full-length grill covers to folding front shelves, as well as bottom shelves waits readily. Likewise, all-natural hardwood pellets come optionally with the offer, which prioritizes your cooking experience primarily, first and foremost. This specimen is sure not to leave your cravings for quality meals unattended, especially with the gadgets that come included. Traeger’s grills maintain a tradition as essential yard additions—nothing brings the family together like a slice of grilled heaven. Share a meal, throw a party, or entertain your own taste buds—Traeger Pro Series is designed for your enjoyment.